When it comes to branding your business your first thought is probably about your logo, your business cards, and the visual elements you use to identity your business. While our sense of sight is important and visual images are memorable – there is more to your brand than just the way it looks. Without Sensory Branding you’re cutting yourself off from the other senses that reinforce your message and strike a chord with your audience. 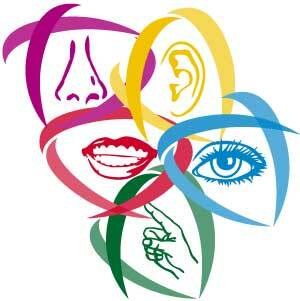 The human race is (typically) born with 5 senses. If you tie your brand to more than just a visual image you have the ability to forge a deeper connection to your audience. Sensory Branding has been in use for years, but you probably never realized it. Effective Sensory Branding is done in a way that registers more with your sub-conscious mind, than your conscious mind. Have you ever considered. . .
. . . how you smell the French fries before you walk in the door of a fast food restaurant?
. . . lights and music in a clothing store that make you feel like you’re in a hip and trendy club?
. . . a comfy floor in a tradeshow booth so you feel relaxed when you step off the hard concrete floor? These are example of Sensory Branding. You can even use Sensory Branding when your business is virtual or web-based by carefully crafting content to stimulate sense memory in the mind of your reader.